We recently covered the post about the launch of Karbonn A6 and we also mentioned its comparison with Micromax Bolt A51. Talking about another low-end Android phone then Karbonn has added another phone named Karbonn A3 to it which is available at 3600 INR on Flipkart. This is a really cheap Android phone and the specifications offered go along with its price. This can be a great opportunity for the users who do not want to invest much but still want to have an idea about functioning of Android. Let us talk about the Hardware Specs. The phone is a DUAL SIM phone allowing GSM band SIMs on both the slots which do not support 3G at all and it comes with an old version of Android which 2.3.6 (Gingerbread), so you can presume that it will be high battery consuming and might show up some troublesome UI lag after few months. It is powered with 1GHz single core processor along with 256 MB RAM which is quite low. The internal memory is of 155MB out of which 105 will be available for you to install the applications moreover it will advisable not to put much applications on your phone keeping the configuration of processor and RAM in mind. The storage capacity can be upgraded to 32 GB with the help of external storage device. The screen size is of 3.5 inches with the resolution of 320×480 pixels. It has a camera on the back with 3MP which supports video recording and no secondary camera is available on Karbonn A3. Unavailability of 3G and absence of secondary camera should not turn you off as at this price no other phone offer these 2 features. This phone supports WiFi connectivity and hotspot, Bluetooth and has a slot for 3.5 mm jack of your headsets. 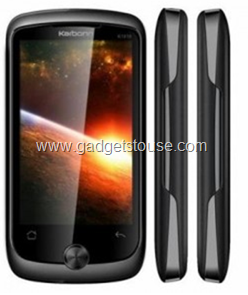 Talking about the sensors of Karbonn A3, then it does not have Accelerometer, Gyroscope and Compass. It is like another Chinese phone with Android available at such a low range which will obviously be prone to the UI lag and electronic discrepancies. Though you can chose this phone over other innumerous Chinese phones due to the popularity of its brand name in India and you can get this phone under warranty by Karbonn.